snowdeal.org > ex machina: the eric update - day 238: the best book you've never read. yet. the eric update - day 238: the best book you've never read. yet. while you might be absolutely sick of pictures of odin reading, i'm going to put in a plug for odin's favorite book that you've never read, itty bitty drum, which produced by my brother-in-law who enjoys writing children's books in his spare time. itty bitty drum hasn't been published, but it should be - it's vibrantly illustrated and the rhymes and repetition make it fun to read. 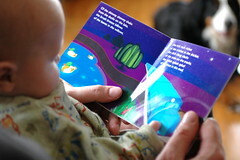 it really is one of odin's favorites and we read it to him at least once a day along with a new book or two. and no, smarty pants, my brother-in-law didn't ask me to sing the praises of the book.